This site was named after the founder of Copenhagen, Bishop Absalon who, after the Viking Age, defeated the Wends on Rügen and beheaded the false God Svantevit. The site is on the edge of Copenhagen with good traffic connections to the inner city by bus and train (timetables available from reception). Absalon has 475 pitches (all for tourers) with 13A electricity on pitches that vary in size (70-100 sq.m). On the older fields, pitches are partly separated by mature trees which provide some shade, whilst the newer areas are open. To the back of the site is a large tent field and there are 31 hardstandings for motorhomes. When we last visited the site the terrain looked uncared for and we thought drainage could be a problem in bad weather, we're happy to say this is much improved and new electricity and water points have been placed. 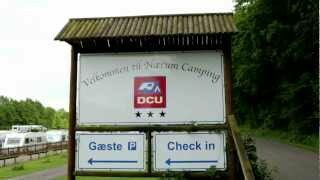 Since our previous visit, the DCU headquarters have been built in front of the site. There is some noise from over-flying aircraft and many international groups of young people visit the site, although they are pitched on a separate field. Two sanitary blocks (one old, one more modern, cleaning variable) with basic facilities. Washbasins in cabins and controllable hot showers (free). Family showers. Facilities for disabled visitors. Laundry. Basic kitchen. Motorhome services. Basic playground. Shop. Dining room with TV. Takeaway. From either direction on the E55 take exit 24 onto 156 Roskildevej road. Continue towards city centre. Site is signed on E55 and on Roskildevej.